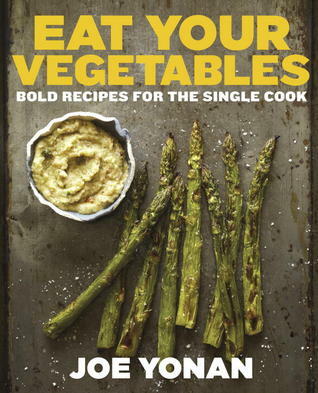 Eat Your Vegetables: Bold Recipes for the Single Cook Whether you’re­­ a single vegetarian, an omnivore who’s looking to incorporate more vegetables in your life, or a lone vegetarian in a meat-eating household, you know the frustrations of trying to shop, plan, and cook for one. How to scale back recipes? What to do with the leftovers from jumbo-sized packs of ingredients? How to use up all the produce from your farmer’s market binge before it rots? There’s no need to succumb to the frozen veggie burger. With Eat Your Vegetables, award-winning food editor of The Washington Post and author of the popular column Cooking for One, Joe Yonan serves up a tasty book about the joys of solo vegetarian cooking. With 80 satisfying and globally-inspired vegetarian, vegan, and flexitarian recipes such as Spinach Enchiladas, Spicy Basil Tofu Fried Rice, and One-Peach Crisp with Cardamom and Honey, Yonan arms single vegetarians with easy and tasty meal options that get beyond the expected. In addition to Yonan’s fail-proof recipes, Eat Your Vegetables offers practical information on shopping for, storing, and reusing ingredients, as well as essays on a multitude of meatless topics, including moving beyond mock meat and the evolution of vegetarian restaurants. I am so excited to be reviewing this cookbook. 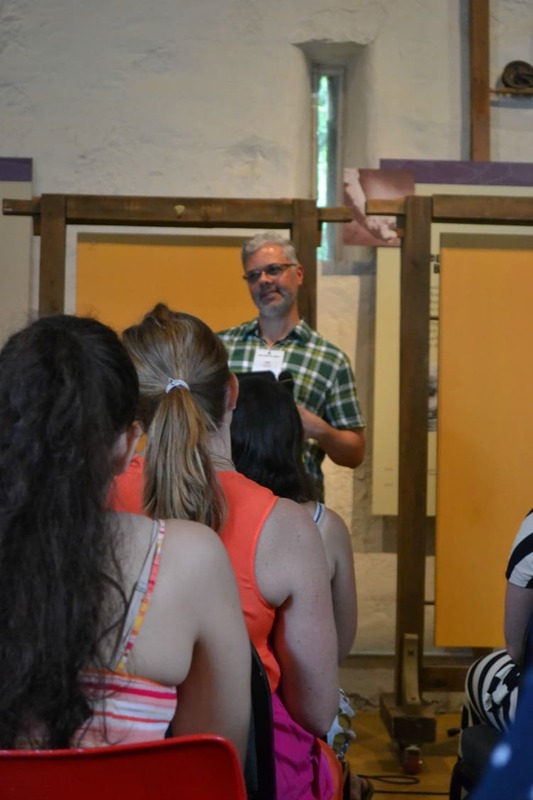 Last summer I went to the Big Summer Potluck and was lucky enough to meet Joe Yonan, the author. He was one of the speakers at the conference and his story was so inspirational. It also doesn’t hurt that he writes for the Washington Post which is a newspaper I get every Sunday since we live only a few hours from Washington, DC. Not only did I get to hear him speak and get to talk to him in person, we were served a vegetarian dinner with recipes from this cookbook! I ate vegetable dishes I didn’t even know I liked and ended up loving them! I was so excited to receive a copy of this cookbook for review because I had been looking into buying it myself. I really like the concept behind this cookbook. We like to cook vegetarian several times a week but I find that so many vegetarian recipes are either laden with cheese and butter or are very bland. Joe Yonan’s recipes are fairly simple with flavors coming from seasonings and the vegetables themselves. It’s also great that the book is tailored for single cooks because so many cookbooks are not. Even though there are two of us in our house, I found this book to be great. I simply doubled the recipes and had the perfect amount of food for the two of us. No eating leftovers for days on end after these meals. Also, since we have a CSA again this summer, I’ve found that this cookbook has many great recipes for using the less common vegetables. The cookbook is divided into salads, dressings, soups, sandwiches, foods on the stovetop, baking and broiling, sweets, entertaining, and recipes for the fridge, freezer, and pantry. Some of the recipes I can’t wait to try include the Kale and Caramelized Onion Quesadilla, Baby Eggplant Parm, Fusilli with Corn Sauce, One Peach Crisp with Cardamom and Honey, and Tomato Sauce with a Kick. The photos in the book are big and beautiful. I also enjoyed reading the blurbs that came with each recipe. Also included in every section are a few pages with a personal story. I really like when authors include personal stories from their lives. 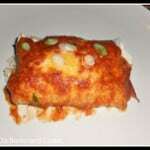 I recently made the Spinach Enchiladas for my husband and I. I doubled the recipe which made 4 enchiladas. 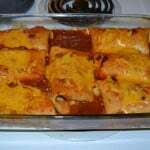 My husband will always eat vegetarian enchiladas but he would much rather have meat in them. I think we were both pleasantly surprised with the flavors in these enchiladas. There was a little spice from both the tomato sauce with a kick and the jalapenos and the cheese on top was delicious. 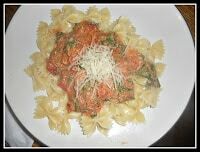 I’d love to share with you the recipe for the tomato sauce with a kick, but in order to get that you’ll have to buy Eat Your Vegetables: Bold Recipes for the Single Cook . Pour the oil into a small skillet over medium heat. When it shimmers, add the shallot, garlic, and jalapeno and cook until soft but not browned. Add the spinach and stir-fry until it has just wilted, then scrape the mixture into a bowl and stir in the yogurt. Season with salt to taste. Warm the tortillas to make them more pliable. Immediately wrap them in foil to keep them warm. Pour the thinned-out tomato sauce into the skillet that you sauteed the shallot mixture in and bring it to a boil over medium heat, then reduce the heat to low so that the sauce is barely shimmering. Use tongs to dip the tortillas into the sauce one at a time, leaving them in for just a few seconds; lift them out, letting the excess sauce drip off, and transfer them to a plate. Spread about a quarter of the sauce on the bottom of a small casserole or individual gratin dish. Lay the softened tortillas on a word surface. 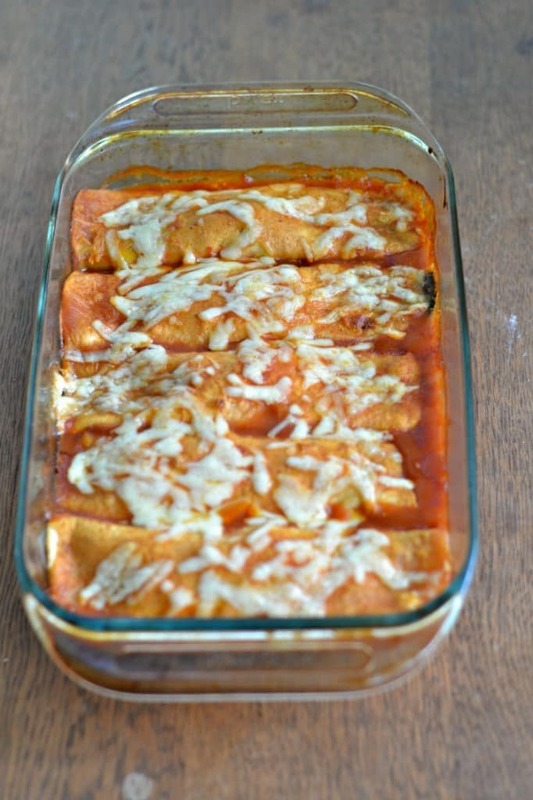 Place half the spinach mixture in the center of each one, then roll the tortillas to form enchiladas and arrange them seam side down on top of the layer of sauce in the casserole dish. 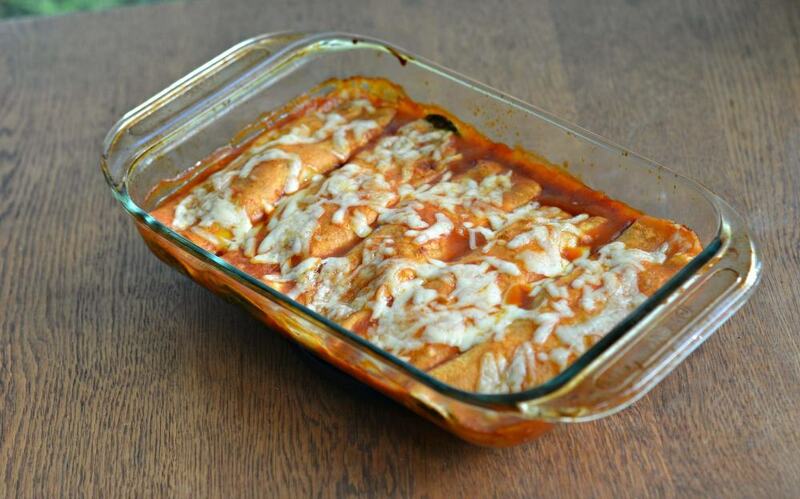 Spoon the remaining sauce on top and sprinkle with the grated cheese. Source: Yonan, Joe. Eat Your Vegetables: Bold Recipes for the Single Cook. Berkeley: Ten Speed Press, 2013. Yum! 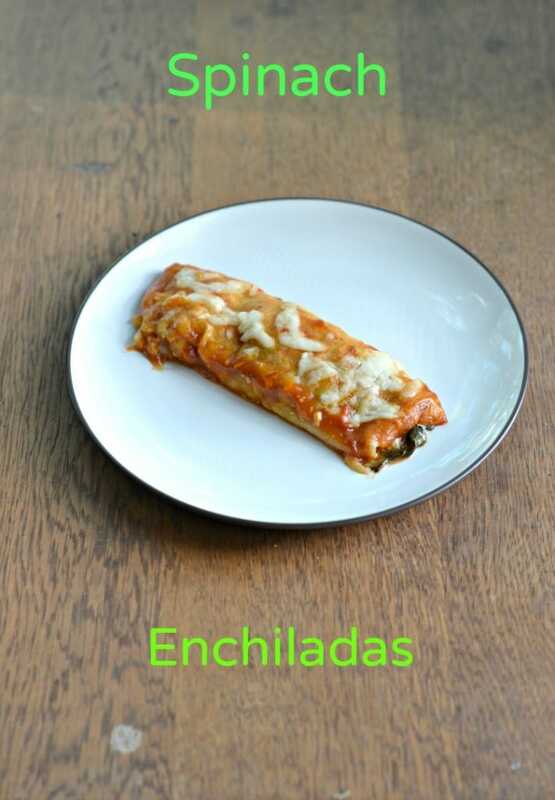 I’m always on the lookout for new enchilada recipes…these look great! We’ll be giving them a try! If you have a free moment, I would love it if you would link them up with Foodie Fridays!